The King of Country music is selling a crown jewel of Texas Hill Country real estate, having listed his San Antonio estate for $8.9 million. George Strait and his family made the custom-built property in the exclusive Dominion community a home, however, times change. With that, the Santa Fe-style home is up for sale through Kuper Sotheby’s International Realty and Strait Luxury – Tamara Strait’s agency (George’s talented daughter-in-law). A virtual tour of the home is available in the video link below. 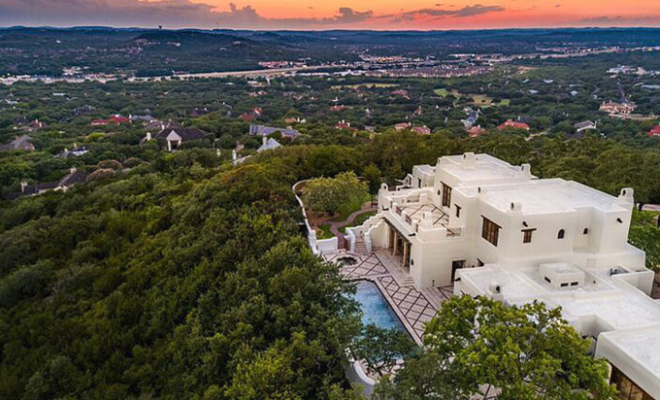 Situated high on a hill, overlooking the city of San Antonio on one side and having amazing views of the Texas Hill Country on the other, Strait’s home encompasses close to 8,000 square feet. Its adobe walls house stained glass windows, 14 hand-sculpted fireplaces, and a copper bar top which was custom-designed for the property. There’s also an additional outbuilding which makes the perfect guest quarters, complete with its own dining space, never mind the amazing infinity pool, and the sports court that’s fit for a king. To put it mildly, the amenities alone would keep you busy for weeks upon end. You’d never want to leave! The main house features three bedrooms with en-suite baths, as well as fireplaces in each, and it sits on 12.2 acres of gorgeous property in the Texas Hill Country. “It’s special because of the amazing thought and attention to detail that was put in to every step of the build. This home truly is one of a kind and can never be recreated,” explained Tamara Strait to cowboysindians.com. The entire estate is a dream come true for anyone looking to live in the lap of luxury in the San Antonio area. And for a George Strait fan, it would almost make you feel giddy. But that’s not reason enough to purchase the home, now is it? Of course, it is! Those looking for further details regarding this listing and all of its amenities can visit the Strait Luxury real estate page at the link available here.